Tibetan Beef and Sichuan Peppercorn Dumplings | Om nom nom! To make the filling, combine the beef, onion, Chinese chives, ginger, and garlic in a bowl. Use a fork or spatula to stir and lightly mash the ingredients together. Before assembling the dumplings, line steamer trays and/or a baking sheet with parchment paper. (If you are making the dumplings in advance, or plan to freeze them, lightly dust the paper with flour to avoid sticking.) For each dumpling, hold a wrapper in a slightly cupped hand. Scoop up about 1 tablespoon of filling with a bamboo dumpling spatula, dinner knife, or fork and position it in the center of the wrapper, pressing and shaping it into a mound and keeping about 1/2- to 3/4-inch wrapper clear on all sides. Use your fingers to pleat and pinch the edge together to enclose the filling and form a closed satchel, or simply fold over to form a half-moon. 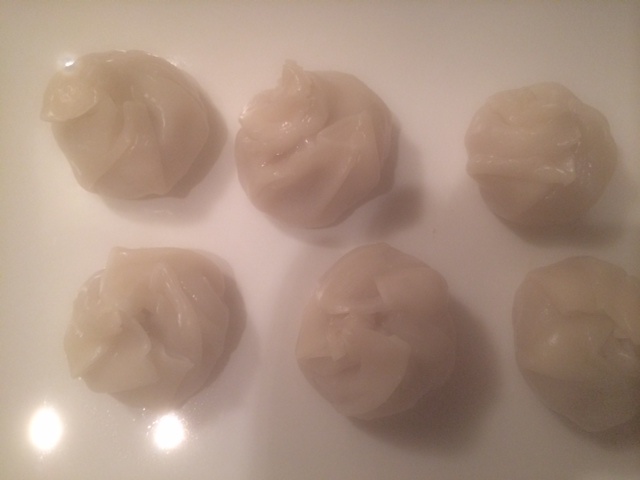 If you are steaming right away, place each finished dumpling in a steamer tray, sealed side up, and 1 inch away from the edge if you are using metal steamers. Repeat with the remaining wrappers, placing them in the steamer about 1/2 inch apart. If you don’t have enough space on your steamer trays to steam all the dumplings at once, or if you are not steaming them right away, place the waiting ones on the prepared baking sheet, spaced a good 1/2 inch apart. Assembled dumplings can be covered with plastic wrap, refrigerated for several hours, and cooked straight from the refrigerator. Or, freeze them on the baking sheet until hard (about 1 hour), transfer them to a zip-top plastic bag, pressing out excess air before sealing, and keep them frozen for up to 1 month; partially thaw, using your finger to smooth over any cracks that may have formed, before steaming. To cook, steam the dumplings over boiling water for about 8 minutes, or until they have puffed slightly and become somewhat translucent. Remove each tray and place it atop a serving plate. Serve immediately with the sauce in a communal bowl. Eat these with fork and spoon on a dish to catch all the juices. Put a little sauce inside the dumpling after you’ve taken a bite and sucked out the juices.